Alice Faulkner bears some indiscreet letters sent to her late sister by a crown prince, and is determined to protect her sister’s memory. To prevent an international scandal, Count von Stalburg has partnered with Sir Edward Palmer to attempt to negotiate the return of the letters before the prince’s marriage, but find that the Larrabees, a family gang of crooks, have gotten to Alice first and are holding her captive until she surrenders the letters to them so they may blackmail the prince. Therefore they go to Sherlock Holmes to try to get Alice and the letters, and when they cannot match Holmes themselves, the Larrabees go to Moriarty. At the beginning, the film states that it is a complete replica of the stage play. In the sense that all the actors are reprised from the stage production and the sequence of events are probably the same, that can be considered true. However, the adaptation seems to lose a great deal in converting from the stage, a very talky medium, to the silent screen. The story is there, the actors are there, the hat and pipe are there, but the intertitles are the bare minimum (which is still a lot since there’s a lot of plot to explain). Perhaps the actors are performing the script with little change, but as we can’t hear them, we don’t get those lines, or at least many of them. The story is credited as being based upon A Scandal in Bohemia, The Final Problem, and A Study in Scarlet, but the only parts of the latter two I can come up with are that they introduce Moriarty and Holmes. I’ve doubtless gone on before about my mixed feelings about relating every Holmes adaptation to Moriarty and Irene Adler (here substituted with Alice). On the surface, it’s irritating that everyone keeps going to those wells, making Adler out to be Holmes’s great love and Moriarty his constant nemesis when neither of them are much present outside their introductory stories, but at least in Moriarty’s case, it perhaps makes more sense for him to have a hand in just about everything, since Doyle describes him as such without doing much to demonstrate it. As for Adler, love stories sell, and she did have some profound effect on him that may be chosen to be read romantically. The most obvious change made to Alice is that the letters and the affair they indicate are not hers. This is clearly a choice made to place her as a more respectable love interest for Holmes, but has the side effect of confusing her motives in keeping the letters. It makes sense that she doesn’t want anyone else to have them, but I see no reason she would have to not simply destroy them. If they aren’t her own, there’s not nearly the sentimental value Adler had for her letters and photograph. More subtly, the adaptation makes Alice a woman in need of rescue rather than a confident intellectual match for Holmes. Meanwhile, Holmes seems more a general hero than the genius of observation and deduction we know him as now. His strongest skill in this movie is psychology, putting plans into effect to manipulate others’ actions. Moriarty is more of a “consulting criminal” in this movie than in the more recent retellings that actually use the term. He seems like Mycroft, staying at his desk unless some special reason calls on him to do some legwork, and the “special reason” is pretty much just a chance at getting Holmes out of the picture. I realized that since this is 100 years old this year, and as before this entry the earliest date in my tags is 1920, this is undoubtedly the oldest movie ever featured on Yesterday’s Movies. 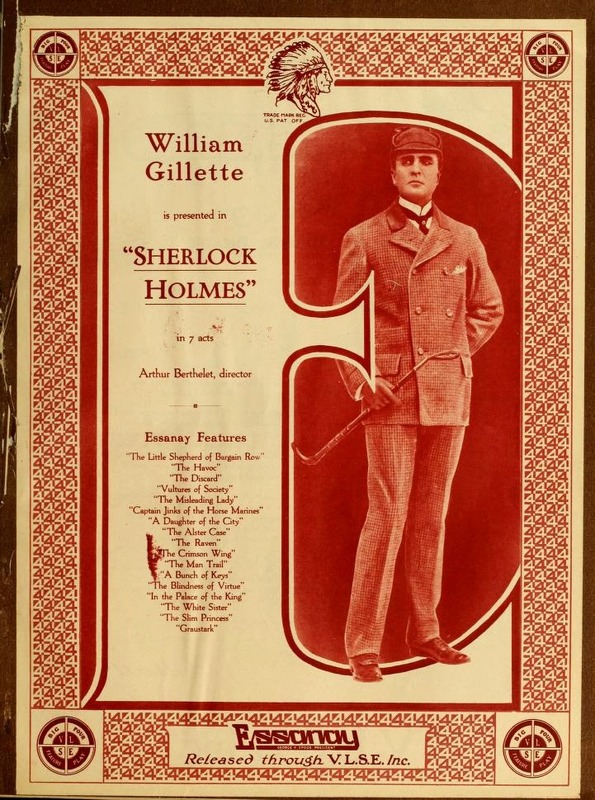 So there again is something special brought to this blog by Sherlock Holmes.